Although band members have come and gone in this well-known Irish band, it's music is Lunasa've Always Been That Their strength, literally holds the glue that these talented performers together. Formed in 1996, the band is currently made ​​up of some high caliber musicians, Sean Smyth on the fiddle and whistles, Cillian Vallely on Uilleann pipes, Kevin Crawford on flutes and whistles, Trevor Hutchinson on double bass and Ed Boyd on guitar. 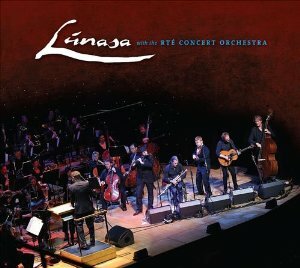 Collectively, the band has issued nine previous recordings and now this one, Lunasa With the RTÉ Concert Orchestra , que, I think is Their tour de force. The RTÉ Concert Orchestra is an award winning organization whose roots go all the way back to 1948 in Radio and other mediums. The addition of this incredible ensemble adds a sense of drama and fullness to this remarkable Already traditional Irish and Celtic recording. Casu, the opening tune, starts out slowly, then builds, and gives the band and the orchestra a workout that can only be labeled as pure joy. As is the case of Most Traditional Irish music, each track is compiled of several airs, jigs, and reels. The music of Casu great features flute and guitar with a resounding backup from the orchestra. An Buachaillin Ban (The Fair-haired Boy) is a suite of songs blend seamlessly into That a lament of sorrow although the subject matter is quite poignant. The melancholy ballad, que sounds mystical and classical, is over eleven minutes long and reminds me of a goltraj , a song of sadness. It is my favorite on the album. The Influence That Cillian Valley had on the Lord of the Dance score is quite evident on the tune Lekan Mor . I can easily imagine the leaps and bounds of the characters as the music plays out with a lively flourish. The flutes and whistles convey a sense of magic and Encourage you to believe. The Minor Bee is made ​​up of the trilogy Minor Slip, Loudeac Ronde and the Red Bee. In this work tremendous flute as the orchestra seems to act as a background voice. The Brittany tune, Ronde of the Leprechaun Dance Loudeac or as it is sometimes called, is a spritely jig amongst the The Slip and the Red Bee, but all are quite animated. With dark brooding cello, the song The Merry Sisters of Fate closes the album like a bittersweet goodbye. The Neo-classical Their recording of one more popular tunes (and an album title) shows the Flexibility and creativity of the band. The haunting cello paints a foreboding background of mists and fens until you get a jolt of Sean's fiddle. The tune then takes life and the race is on. The music is more than just a swaree. The pairing of a full-bodied orchestra and a band of talented traditionalists makes for some extraordinary entertainment. You get the best of many worlds In These reels, Namely Celtic, Irish, Folk, and Classical. The sound is a balance of yesterday and today. Their music is Reminiscent of the best of Ronan Hardiman That came for the Lord of the Dance musicals and a magical blend of traditional tunes, que are performed by highly skilled artists. Artists in every sense of the word.